It’s any normal day. You’re at work, doing work stuff, and you get a call from the principal at your son’s school: he’s been suspended for three days for roughhousing on the bus. Or, maybe he’s already had a few mishaps in behavior and is now facing a much longer suspension. Or, maybe it’s a more serious offense and school personnel are already talking about expulsion proceedings. What can you, as a parent, do in response to these situations? Before we discuss what you can do, I think it’s important to recognize the difference between the following natural consequences. In-School Suspension (ISS): An in-school suspension is when your child is taken out of her regular classes and put into a separate room. She will need to complete all of her daily work and also spend her lunch break in this one room. This is probably the easier one to deal with as a parent because it doesn’t change your family’s daily routine much at all. Out-of-School Suspension (OSS): An out-of-school suspension is usually a number of days when your child is not allowed to go to school, be on school grounds nor attend any school functions. The number of days can vary depending upon the severity of the behavior, whether or not there have been previous suspensions or other mitigating factors. If your child is not of an age where he can stay home alone, you will need to come up with some sort of plan for having him supervised during the day. Expulsion: An expulsion, on the other hand, is a more serious consequence. Your child is basically removed from the school rosters and not allowed to attend school or school-related activities for a much longer period of time (a year or more). Sometimes, this may also include not being allowed on school property for any reason, even to attend a sibling’s sporting event, concert or graduation. While suspensions are usually instituted by the principal or vice principals of a school, an expulsion is a process that involves going before the school board or other educational administrative personnel for a hearing. It would be determined at this hearing whether or not your child will be expelled. Your child would also be allowed legal representation at this hearing. I point out these differences above because many parents naturally panic when they get this call and it’s easy to respond in a manner that is less than effective. This panic is a pretty normal response which can lead to futurizing: “What is this going to mean for my child now and later on down the road?” It may be helpful to take a little time to process the information so you can address the issue with your child in as calm a manner as possible. I have even suggested to some parents when they contact the parent coaching service about this that they not talk with their child about what happened until the following day. It can help to look at it this way: your child is suspended, and yelling and screaming at him isn’t going to change that fact. Take some space from the issue can help you calm down and look at the situation from the perspective of “What do I want my child to learn here?” When you’re able to talk with your child in a calm, rational manner, there’s a greater chance you can find out what his perception of the situation is — and possibly even problem solve with him about what he can do differently in the future. If your child is on an IEP: As a side note, if your child is on an IEP, there are other procedures that must be followed, as outlined in IDEA 2004 (Individuals with Disabilities Education Act). For example, if your child is suspended for more than 10 days, an alternative education plan has to be instituted. I actually got my start working in Special Education when I was employed by a school district to be a tutor for kids in this situation. Some districts have off-site alternative education programs for this purpose. Keep in mind that this alternative placement cannot go beyond 45 school days, however. One thing that is different for kids who receive Special Services and have an IEP is they must receive a Free and Appropriate Public Education (FAPE) and, even in cases where the child is expelled, the school district must develop an education plan for your child. Another thing that has to happen when a child who has an IEP is suspended for more than 10 days (total, not necessarily consecutive) is a Manifestation Determination meeting has to be scheduled. It will be determined at this meeting whether or not the action/behavior that resulted in suspension was a manifestation of the child’s specific disability and whether or not the IEP was not only appropriate but being implemented accordingly by the school. School districts are required to send out a Notice of Parents’ Rights in Special Education Procedural Safeguards. It has been my experience that often these safeguards are written in “legalese,” in really tiny print and it’s a challenge for many parents to read and understand them. I would encourage you to talk with the Special Education director in your school district if you have any questions. There are many other rules and regulations outlined in IDEA, too many to cover in this short blog post. You might even consider finding out if there is an advocate, either through the district or your State Department of Education, available who would be able to walk you through these procedural safeguards and answer any questions you may have. A final word: getting “that call” can feel like an endgame, but in reality, you can try looking at it as more of an intervention or a “call to action,” that gives you the opportunity to work with your child to develop better ways of dealing with challenging situations. 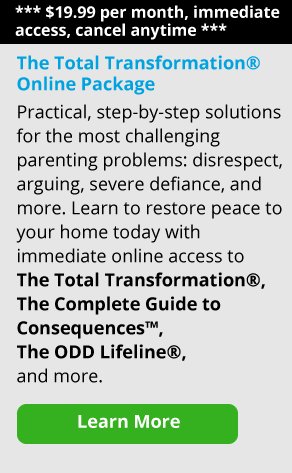 There are many other tools in The Total Transformation Program that will help you respond to your child’s behavior more effectively, helping you turn what seems like a hopeless situation into one with a much more promising outlook. Believe me, there is hope — I help parents find it every single day.